Nicole's Needlework: First Day of School! It's the first day of school here in Charleston County. 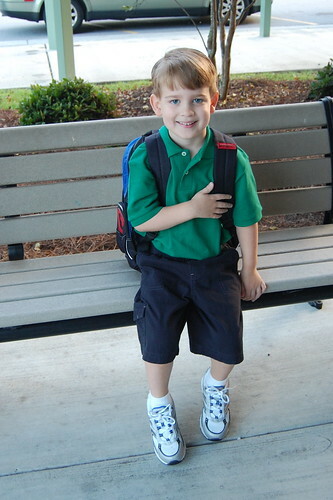 And the first day of school ever for my five year old Jake. He was so brave! I ended up going with the cream (obviously)! Amy had the idea of doing the trim on the top, which I copied. :) I did bring my camera stitching, but forgot my memory card. I have a bad habit of doing that. I think I need to keep an extra one in my camera case. In other news I started another new project (I think I have been feeling anxious about the boys starting school). 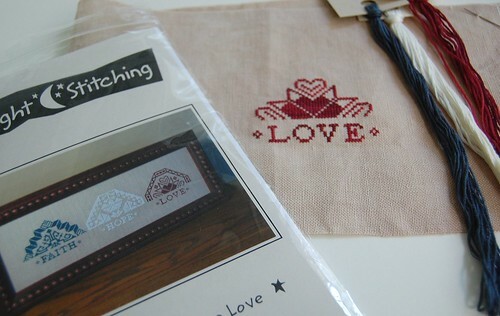 I started "Faith Hope Love" by Midnight Stitching. Your Chocolate Box looks really pretty! I don't think it looks like you need to redo it. Your little guy is so cute for his first day of school with his new clothes and backpack. He will make new friends easily I bet. 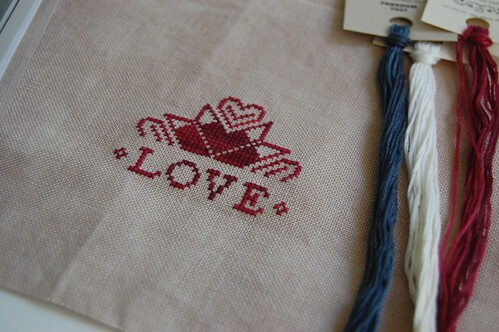 Your stitching is really pretty on Faith, Hope and Love. I need to stitch. I haven't for a few days and I have to get this round robin done so I can go back to my own things. The Chocolate Box is very cute. The soft edges makes it look like a cake! Chocolate Box turned out lovely Nicole! Like the box! And Your son is SO cute! Where did the time go, my son is 31!! When memory cards got cheaper with more memory I started keeping extras with my cameras (small and larger Sony Cybershots) A DSL type is next when I get another camera. As my son says, those take killer pictures. Choc Box looks great and love the Quaker too! Congrats on the first day of school! He looks super excited :). 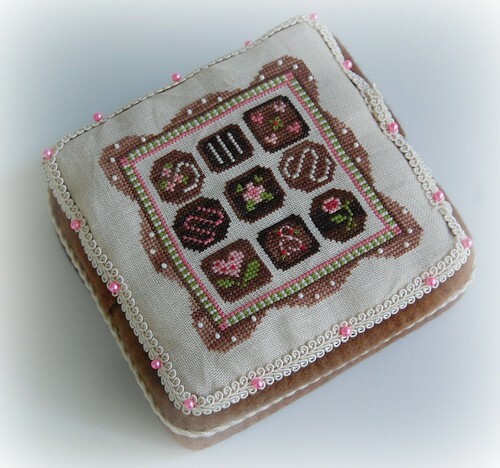 I love how your Chocolate box turned out. Jake looks so assured & confident!! I think you chocolate box looks great - what's wrong with it? And I love your new project! Jake looks really sweet - all grown up and ready for his first day at school! your chocolate box looks great. Hope that your son's first day was fun for him. Jake looks so grown up! My little boy starts 3rd grade next week. Yikes - where does the time go? I think your chocolate box looks lovely - I'm glad you went with the cream trim! I think your choc box looks fantastic! Just tell people they're soft centred chocolates. :) Glad you went with the cream trims too. Jake looks so proud to be going to school. How exciting for him. Your little Jake is adorable! Enjoy Matthew all by yourself! Love your chocolate box!! Your sttiching is always an inspiration to me! Oh I just hate it when my memory card is back home stuck in my computer! It's the first time I read your blog. I admired all the works and your son looks very happy and very pround for his fist day at school! Your Jake is such a cute fella. What a milestone in his life. Your Chocolate Box is soooo cute! I love the "icing"! Quaker Faith Hope Love Finished!